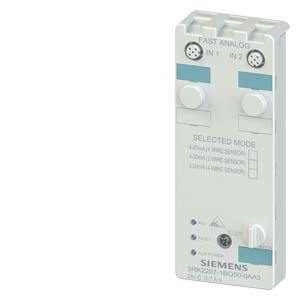 AS-INTERFACE KOMPAKTMODUL K60, IP67, A/B-SLAVE (SPEC. 3.0), ANALOG, 2AE(1AE), 2(1)X EINGANG STROM 4..20MA; +/-20MA; M12-BUCHSEN. AUFLOESUNG 12 /14BIT, 1- ODER 2-KANALIGER BETRIEB, UMSTELLBAR UEBER ID1-CODE. MONTAGEPLATTE 3RK19010CA00 IST SEPARAT ZU BESTELLEN.